I wanted to veer away from the normal subject matter and touch a little bit on personal finance. We’re going to visit the concept of the emergency fund(“e-fund”). It’s a subject that’s made some heavy rounds in the financial news sites and blogosphere to start 2014, but the subject of e-funds gets expounded on annually in countless articles. Maintaining access to adequate amounts of liquidity when a true need arises is simply a matter of prudence. The rich may not call it their “emergency fund” per se, but they tend to keep enough cash on hand or maintain easy access when they need it. The middle class are generally fastidious about maintaining an e-fund despite the level of job security or adequate assets already accumulated. The less fortunate, and those just starting out in the game of asset accumulation, are simply looking to scrape together what they can so they have something squirreled away for a genuine unexpected need. Everyone has to assess their own total financial situation and determine what is the best mix for their e-fund. Is it all cash? Is it all investments and play the statistical odds game against Murphy’ Law that the markets won’t be in the middle of a serious dislocation at the exact time you need to liquidate? Is an e-fund even needed? Suze Orman and Dave Ramsey, the personal finance gurus for the Great Unwashed, have two decidedly different takes on the e-fund but both believe in the concept. Orman believes that 8 months of expenses should be covered with the emergency fund, and that one should forsake making more than minimum payments on any credit card debt in order to build up that surplus. Ramsey believes in building up $1,000 ASAP for emergency purposes and then paying off all non-mortgage debt i.e. revolving credit, auto loans, and student loans by utilizing the debt-snowball method. Then once those debts are paid, begin building an e-fund to cover 3 to 6 months’ worth of expenses. The one glaring consistency across Orman, Ramsey, and the countless other commentators is the total lack of imagination in how to allocate the e-fund. Here’s the same list of financial instruments shared ad nauseum across the web: online savings account, CD’s, laddered CD’s, money market, T-bonds, or I-bonds. If one truly wants a “risk free” tool for safe interest accrual then these are of course adequate options, but you still have penalty risk with the CD’s and bonds. The problem is that these instruments yield virtually nothing. Thank you ZIRP. I’m a proponent of part cash/part investing. If you’re going to maintain a sizeable e-fund, which is of course a relative term, then there are several tools available that offer vastly superior yield without the pure risk of stocks. I didn’t say zero risk; just not pure stock market risk. I’m talking about closed-end funds(“CEF’s”) in the income sectors. Specifically, I’m talking about investing in CEF’s that hold preferred securities, muni-bonds, and energy-related MLP’s. CEF’s can be a good addition to an e-fund because they easily provide yields over 5% and can often sell at a discount to net asset value(“NAV”). Meaning, the total market capitalization of the closed end fund will trade for less than the total market capitalization of the investments the fund holds. It is not unusual to be able to enter a position into a CEF for $0.90 on the dollar. Stated another way, if Make-Believe fund’s NAV is $10 a share, then the market may place a value on the share at $9. This discount may occur for any number of reasons. Circumstances are different for each fund. The most obvious reason is sentiment in the primary asset class of a CEF’s holdings. My current 3 favorite CEF’s for partial e-funding are tickers: JPS, NEA, and KYE. I’ll get to some details on each in a moment. I want to share a site first. If you’re one of my readers who is un-initiated in the world of closed end funds, then stop by CEFConnect.com. There you can find most everything you need to explore the world of CEF’s and link to the sites of each asset manager to obtain even more detail about a fund you may be interested in. It’s a comprehensive site that provides news, education, interviews, a screener and more. In fact, here’s a snapshot of the screening page I used to pare down my own list of CEF’s. The screener is easily customizable to winnow down the list of hundreds of CEF’s. From the pic above, you can see that my screen utilized a 5% minimum distribution rate, which is the CEF equivalent to yield for you stock dividend and bond coupon junkies. I also screened by discount to NAV and Market Cap to ensure that only funds that traded at a discount and with adequate liquidity would be filtered. The list was narrowed down to 66 closed end funds. I knew what sectors I wanted to choose from, so then it was a matter of assessing discounts to NAV, yields, and market caps to make final selections. The Nuveen name is well known in the CEF space and has a long, rich history operating as a financial institution since 1898. Nuveen possesses total assets under management of $215 billion. Visit Nuveen for additional details about the company and its selection of CEF’s. I like preferred stocks because they’re highly liquid, trade like common stocks, and in a lot of situations can yield income as steady as a bond. Preferred stocks provide no voting rights to shareholders but they are farther up the food chain in the event of a bankruptcy. Preferred stocks generally trade at a par price of $25 and tend not to get too far above or below that except in times of serious economic strain. Municipal bonds are tax free and appear to have a great deal of the fear in the sector already baked into the price. Lastly, the energy-related MLP’s allow for the upside potential of energy production increases across the world by investing in the companies that provide energy transport via pipelines and ship containers. These companies are the “toll booth” operators of energy transport and their consistently assured business allows outstanding cash flows from these master limited partnerships. Additionally, these three are not the most strongly correlated assets across the income space which provides a small margin of safety. JPS is a Nuveen offering that specializes in preferred securities. Why bother with the hassle of researching which credit worthy securities to allocate your funds in when you can have the experts at Nuveen take care of you. JPS offers a juicy 8% yield paid in monthly distributions of 5.5 cents each, and the current discount to the NAV is 11%. So you’d be paying $0.89 for $1.00 worth of assets. 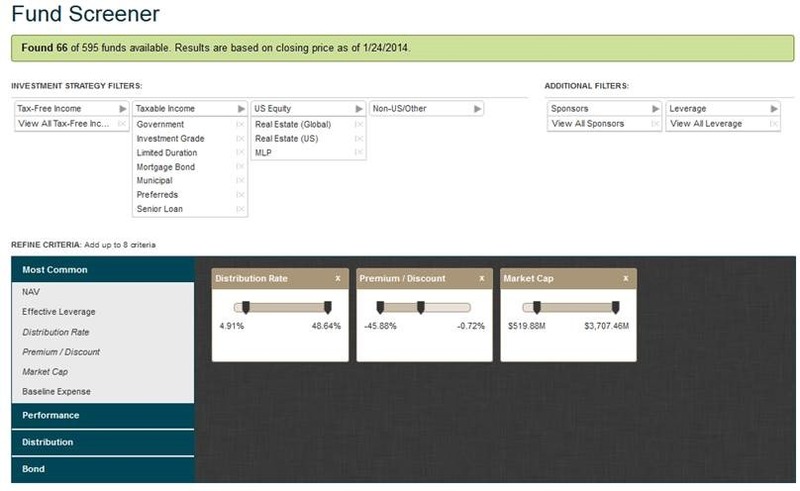 NEA is another Nuveen offering, but it specializes in municipal bonds. Municipal bonds are tax free instruments so they’re probably best utilized in a taxable account, but I’m no CPA or tax attorney so please consult an expert for advice on your specific situation. And remember, the securities described in this post are not a specific recommendation to the reader. They are simply an offering of my preference in how to semi-allocate an emergency fund. Muni-bonds were oversold in 2013 and some fear of muni-bonds may be well founded. Cities in California were going bankrupt. Detroit is Detroit. Puerto Rico is freaking out fixed income investors, but all these fears have now been discounted into the sector. Hopefully, fully discounted. If you recall in my last post, in the last 20 years muni’s have always bounced back to gain at least 10% after a down year. Plus, NEA trades at a 8% discount to its NAV. The best part of this instrument is that while it yields a lovely 6.4% at last close as of this writing, the yield is tax free. So if you’re in the highest tax bracket of 39.6%, that’s a taxable equivalent yield of 10.6%. A double digit yield is not easy to come by these days and here you have a tool that allows you to earn that yield at a discount. Your taxable equivalent yield is calculated by taking the fund’s current distribution yield and dividing it by 1 minus your tax rate. The last fund is KYE, which technically invests across a broad range of energy related assets and not just MLP’s, but I just generalize it as an energy-MLP specialist. 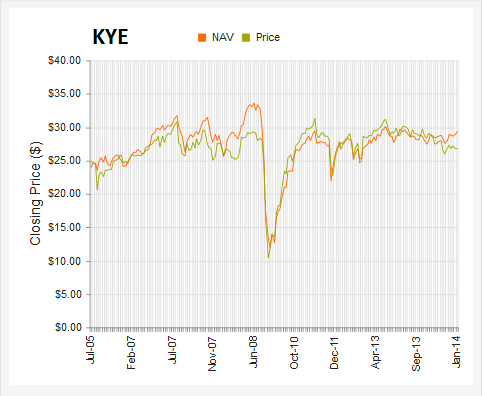 KYE offers a yield of over 7% and trades at a discount of 9% to the NAV. So again, you’re only paying $0.91 for a $1.00 worth of assets. The fund has positions in companies such as Kinder Morgan, Williams, ONEOK, Plains All American, and Teekay; which are all heavyweights in their respective fields. If you believe in the growth of America’s energy production and potential for energy export while also believing in the potential growth of worldwide demand for energy, then KYE appears to be a conservative bet on that growth while also being paid to watch if the thesis is correct. Kayne Anderson is not a typical mass market asset manager. I guess you could consider them a little more boutique in their operations, but $25 billion in total AUM is certainly nothing to sneeze at. They’ve been around for 30 years now and have a focus on energy, muni’s, private equity, and mezzanine level credit opportunities. Learn more at KayneCapital.com. So here’s the point in the article where you think to yourself, “Yeah thanks for the recommendations but how did these investments stack up during the financial crises?” Like I said, no risk can be eliminated; only mitigated. That’s why it’s called investing aka speculating. In 2008 – 2009, every asset on the planet lost value. These 3 offerings recovered surprisingly well, especially NEA and KYE. They fell hard but bounced back fairly quickly into their pre-crisis trading ranges. 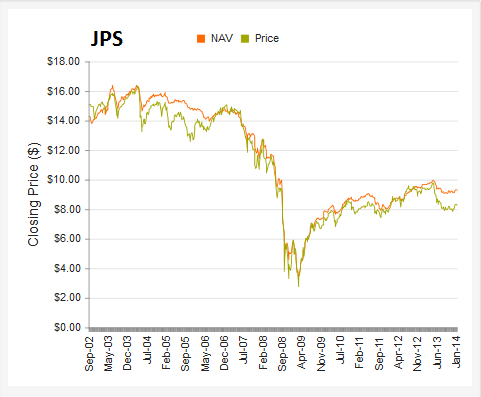 JPS fared worse as it has yet to even touch its inception per share price of $15. However it has risen 150% off of the lows, all while yielding over 7% like clockwork. Observe the following trio of charts courtesy of CEFConnect. Although again, it has not recovered its pre-crash pricing, JPS bounced up to over $8 a share in fairly short order and has maintained a fairly tight range between $8 and $10 a share. With the NAV discount, this looks like a good window for allocation. 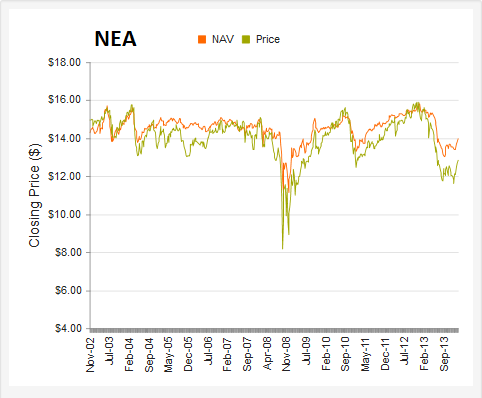 NEA recovered to new all-time highs in 2012, but then a couple of California cities, a Motor City, and a certain salsa dancing island later has brought the fund back down to 2009 levels. The baked in fear and NAV discount present a compelling opportunity for appreciation and yield. KYE has performed the most consistently before and after the last financial crisis, trading in a tight range between $25 and $30 a share. Pre-crisis, the fund primarily traded at a discount. Post-crisis, it has traded primarily at a premium. Now, despite all the energy being discovered, drilled, and pumped in America in addition to the ZIRP environment, KYE again trades at a discount towards the lower end of the price range. These charts show that there are obvious risks in making an investment. One can’t just allocate some cash to these securities and then forget them like they’re a savings account. These are uncertain times to be investing and you have to be vigilant in constantly assessing the risks of an allocation. The largest risk associated with these funds is interest rate risk. In a Zero-Interest-Rate-Policy environment, these funds can be affected if rates begin to rise. KYE would be less affected than JPS which would be less affected than NEA, which is partly why I have chosen the three holdings, but a rising rate environment would have a negative effect. Fortunately, the widely-known fact that the Federal Reserve wants to maintain ZIRP through 2015 provides at least a 2 year window to take advantage with these 3 closed-end funds. But facts and circumstances can change, and so accordingly, decisions about how funds are allocated must adapt. A couple of ways to help mitigate some of the risks is to use trailing stops as well as look at how far a potential premium builds. If the premium builds too far, say 5% to 10% over NAV, then taking profits may be a good idea. Even accounting for frictional costs, it may be worth earning the capital gain. The resultant cash can then be placed in a different fund, maybe in the same family, that is a reasonable facsimile from a holdings and performance standpoint. Or, you can park the cash in savings again and simply wait for the premium to abate, which by reviewing the charts up above, happens quite often. Now don’t get scared away by those numbers just yet and go running for cover under the low-fee Vanguard umbrella. Keep in mind these fees and expenses are taken from operational profits of the funds. After the fund accounts for these 3 operational expenses, then available cash flows are distributed to shareholders. So despite those fees and expenses, shareholders earn a yield of over 7% in JPS and KYE while NEA provides a taxable equivalent yield of between 8% to 10%. Last time I checked the Vanguard ETF’s, even with their incredible fee structure, there are zero ETF’s that yield over 5%. The universe for financial products is wide and vast; presenting workable solutions for everybody. Assess your own situation. Determine the best course of action for you or your family and make a decision regarding an emergency fund. But now instead of simply reading about the same old non-yielding(but relatively safe) bank tools everyone has at their disposal, you have some high-yielding options that provide a small margin of safety. Remember, if you’re unsure, seek the advice of a professional and always be sure to conduct your own due diligence.